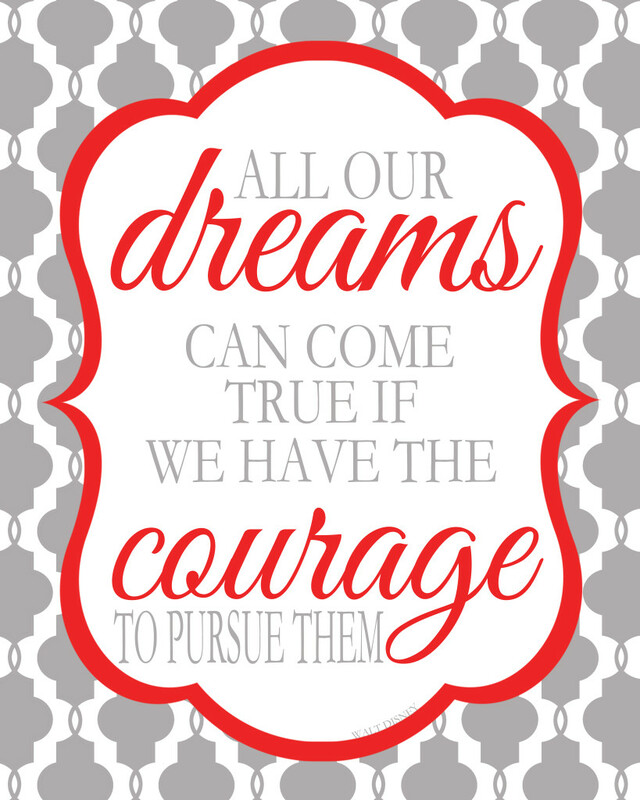 A free printable with a quote from Walt Disney just felt right for today. Primarily because it feels like he is speaking to me. I promise I don’t actually hear his voice, but my theme for this year has been pursue your dreams, step bravely, and forge ahead. It’s not always easy to live that way, especially for a thoughtful, pragmatic planner like myself. I do have some awesome news to share with all of you though: I got my first Etsy order last week (woohoo!) and am currently talking to a bride about designing her invitations. So, good things are happening. I guess I will keeping listening to dear old Walt and have courage. It also felt right for today because I am in Disney World right now!!! I am so excited for this trip. My family (parents, two sisters and a sister-in-law, a brother and brother-in-law, four nieces, a nephew, and husband) are all going on a family vacation. We haven’t been on a large family trip in 9 years; I had just graduated high school, and we had five less family members. If you are interested, I am probably sharing a ton of pictures on INSTAGRAM, especially of the kids who are a lot cuter than me! You can download this free print HERE! This printable is so cute & I’ve been lurking on your blog for awhile, it’s really great!